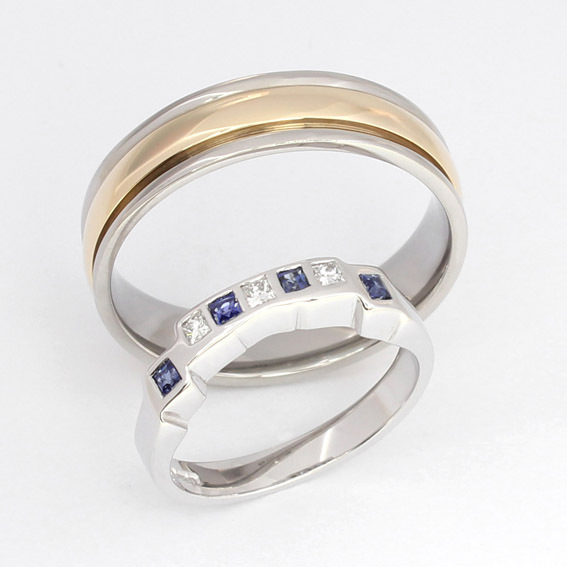 Here are some images of how we helped our customers design their own engagement ring, wedding ring, or eternity ring. Some of our customers have reworked their family jewellery to enable them to wear it to suit their style. If you have been inspired by what we can do, call us today on 0121 353 8450 or book a consultation by hitting the CONTACT link in the top right hand corner. 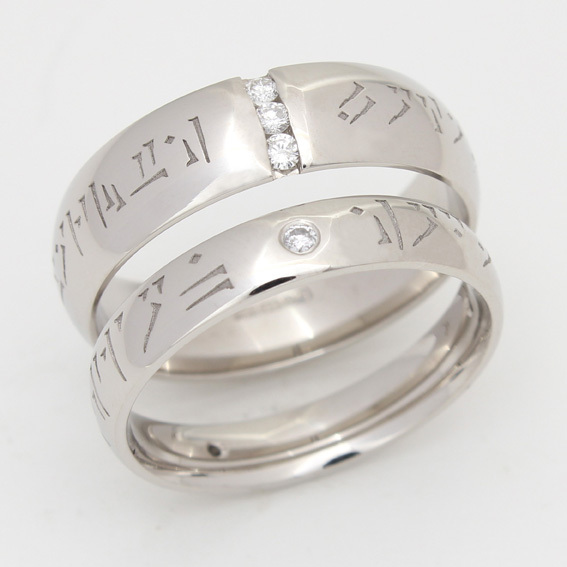 Words in Runic with personal meaning for our customer, then using their own diamonds set to finish the rings beautifully. 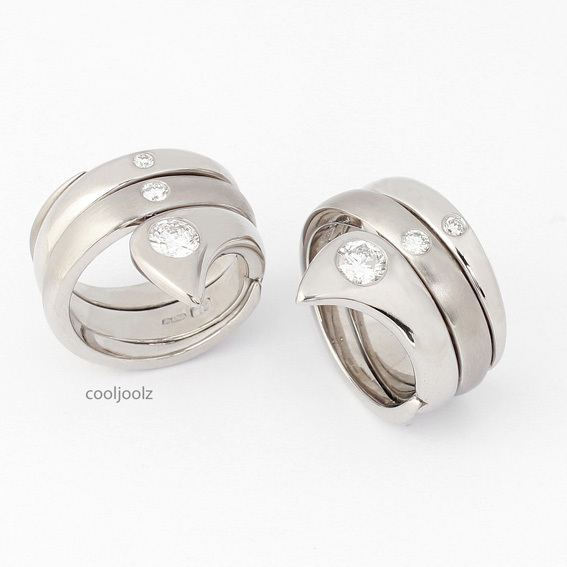 A drop-in diamond set shaped wedding ring for her and a wide ring with diagonal set diamonds for him. 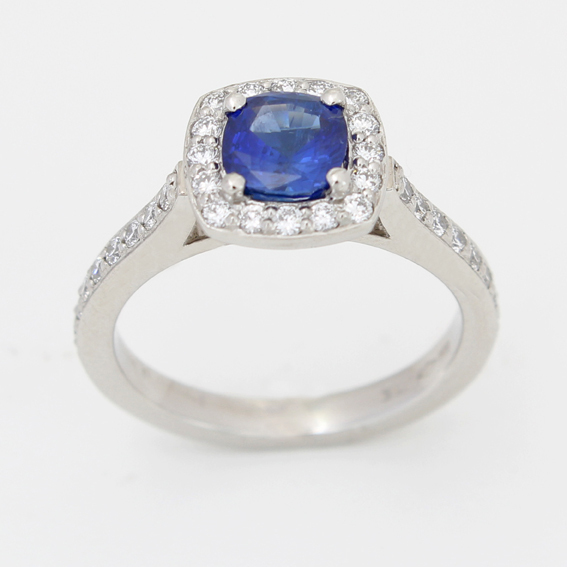 A stunning engagement ring with a central sapphire surrounded by a halo of diamonds with further diamonds on the shoulders. 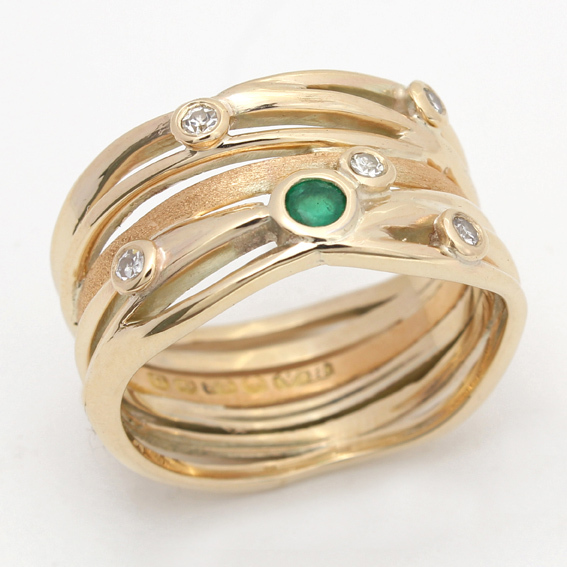 We re-modelled our customers old family jewellery and diamonds into a ring of her own design. 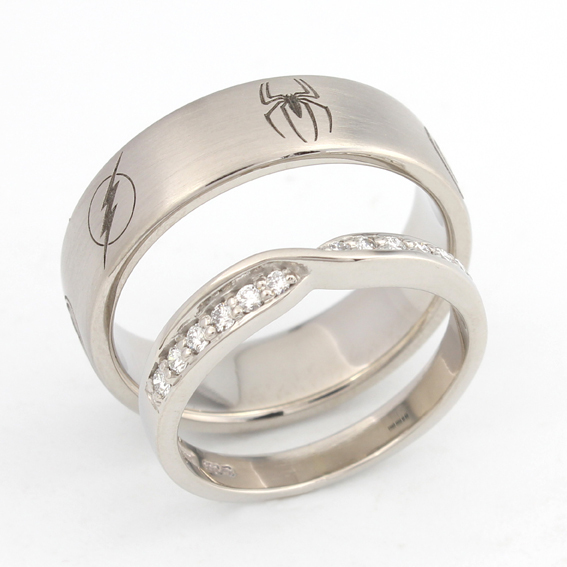 Laser engraved 'hero' designs on his ring and a beautiful diamond set twist for her. 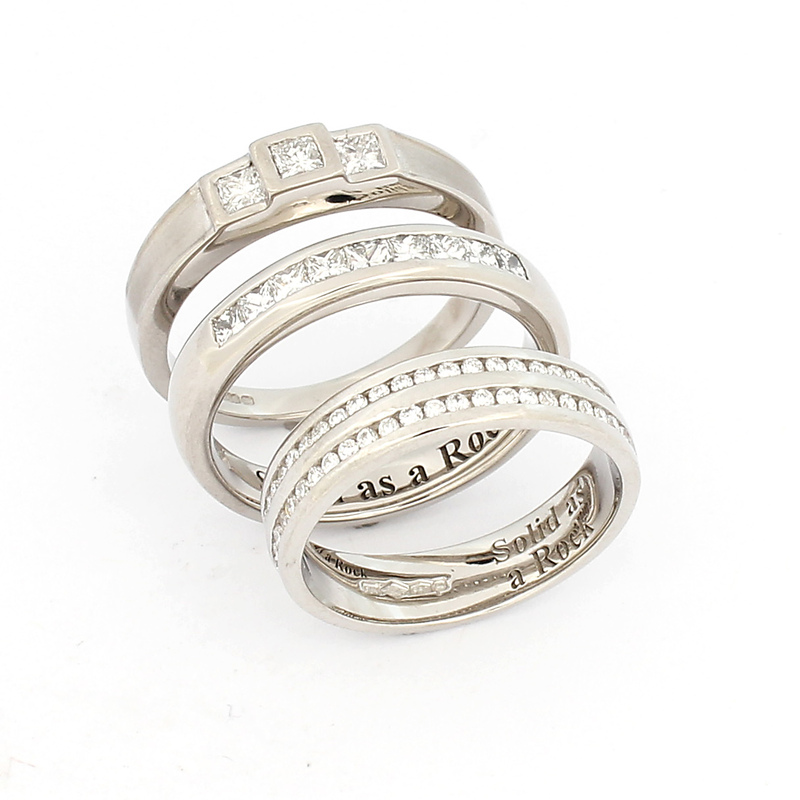 Stunning diamond set engagement and wedding rings that interlock together when worn. 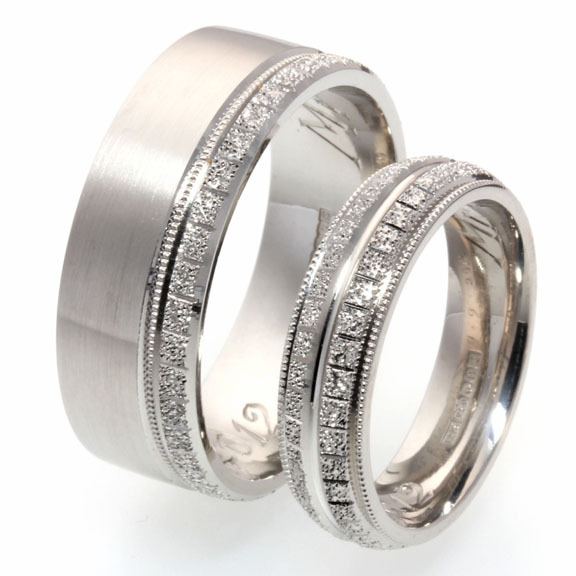 We remade the customer's engagement ring in palladium with diamond set wedding rings and laser engraving. 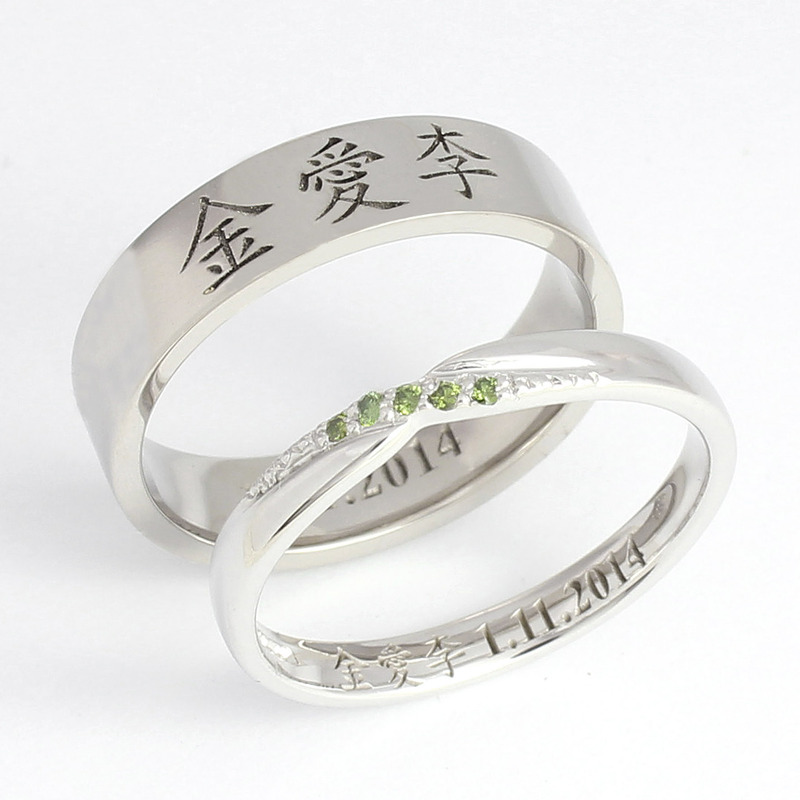 Each ring has their partner's fingerprint on the outside. 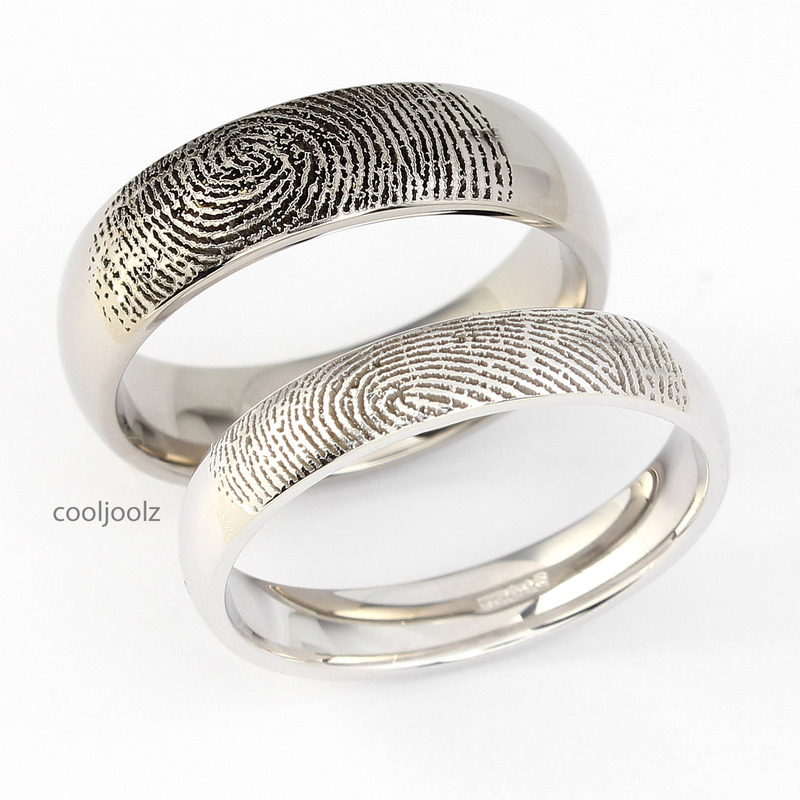 You can't get much more personalised than fingerprint rings! 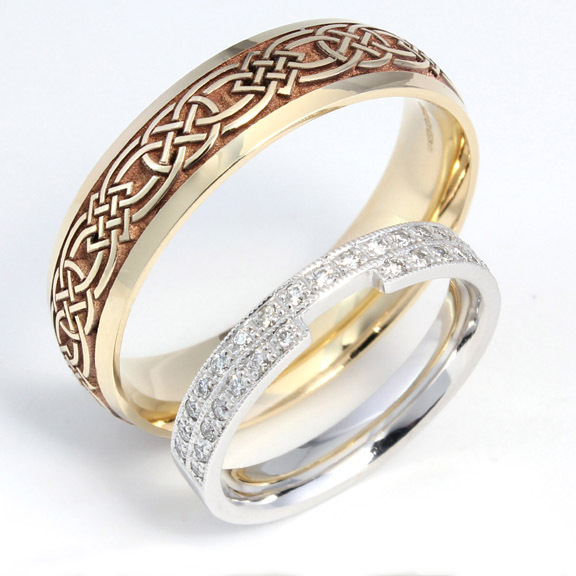 Two rows of diamonds with millgrain feature shaped to fit engagement ring for her and a beautiful celtic laser pattern for him. 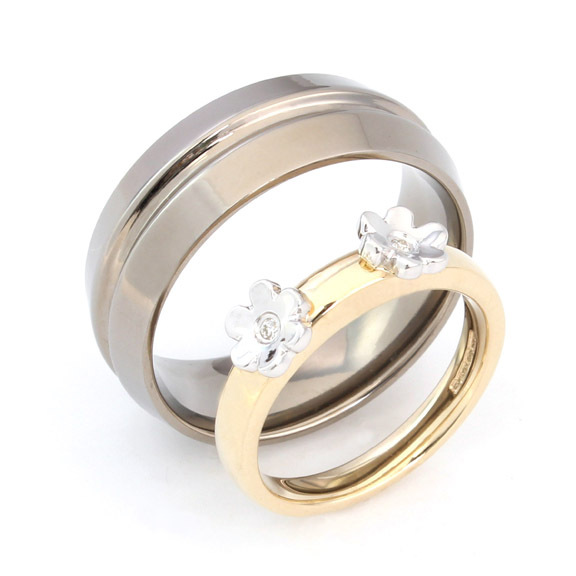 Yellow gold band with pretty white gold flowers set with a diamond. A deep central groove on his 8mm wide band. 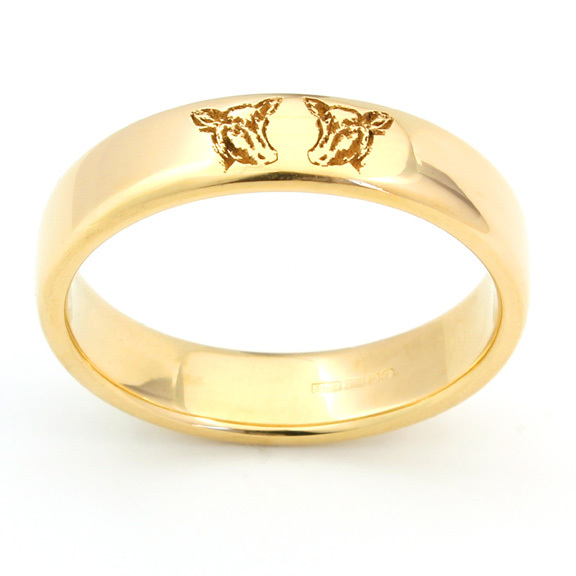 You can laser almost anything as a pattern on your wedding ring! 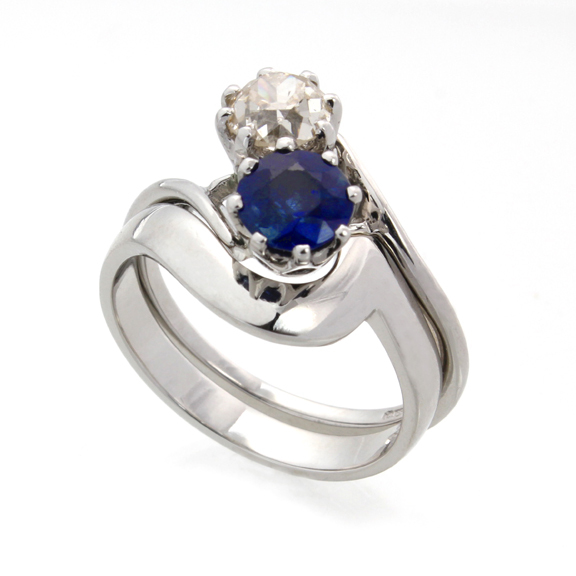 Sapphire and diamond engagment ring with a shaped to fit wedding ring. 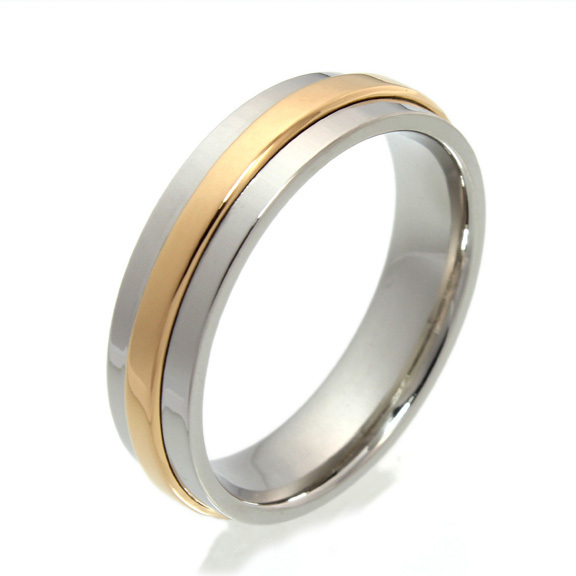 A two tone wedding ring in palladium, incorporating our customer's 22ct yellow gold family ring. 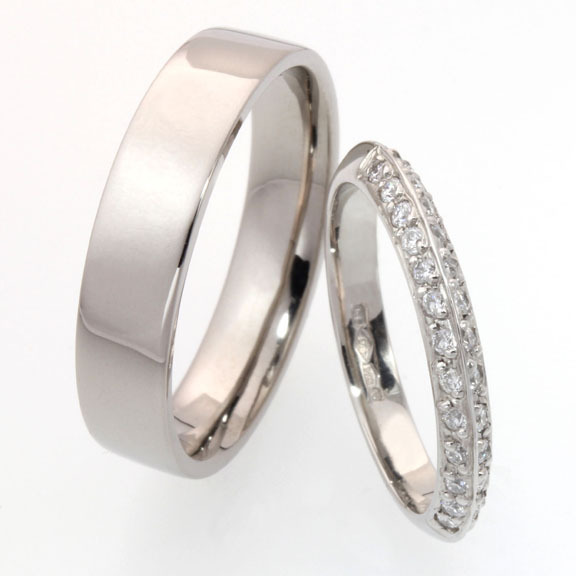 A beautiful knife edge diamond set wedding ring for her with a highly polished flat court wedding ring for him. 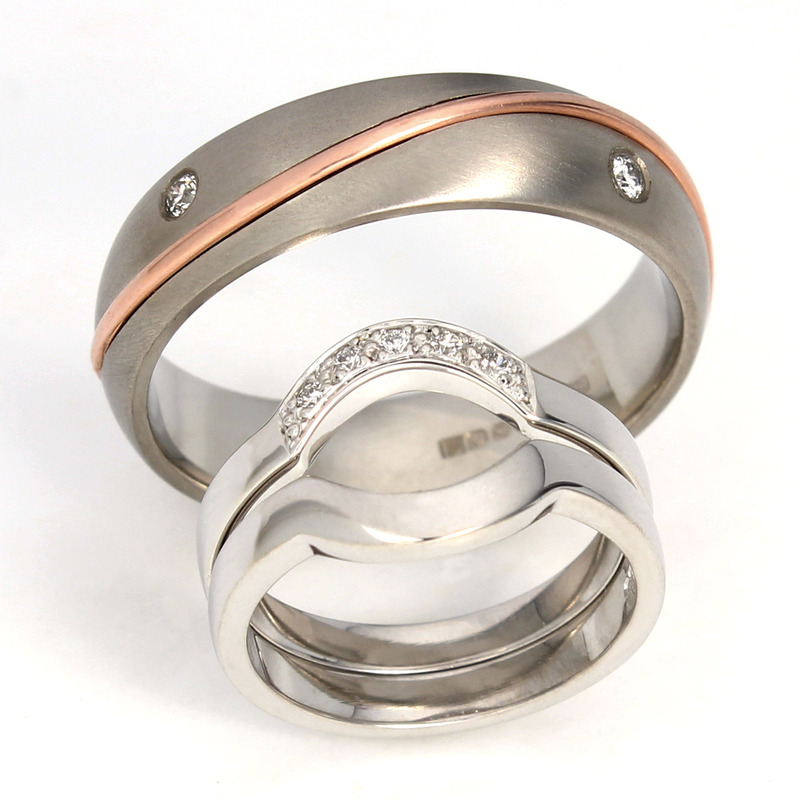 Matching 6mm wedding rings with brushed finish. 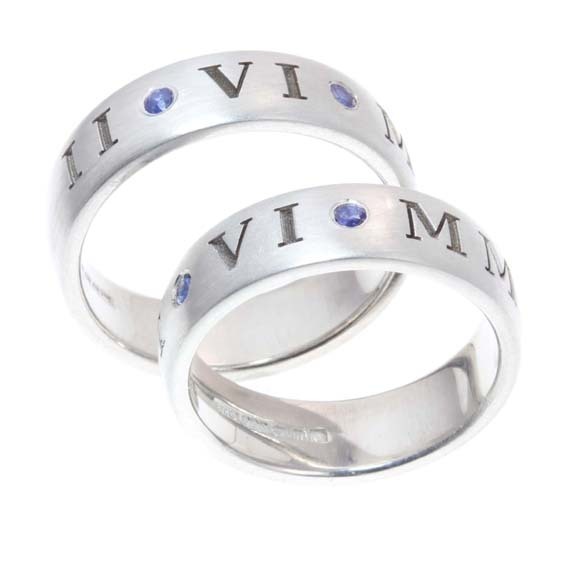 Each with the wedding date laser engraved over the top in roman numerals, with beautiful blue sapphires marking a full stop. 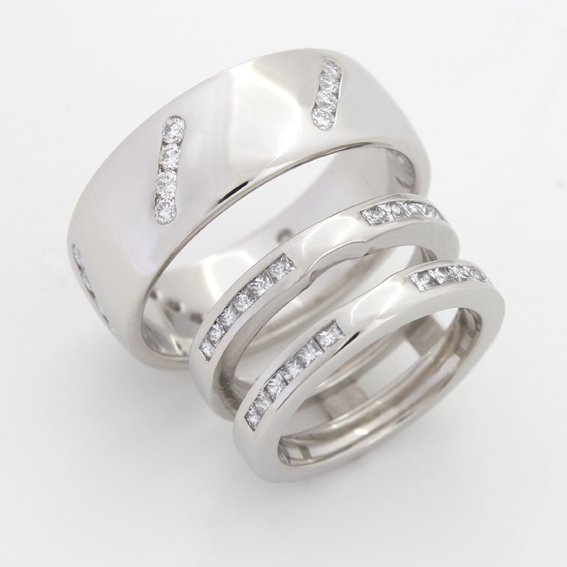 8mm ring with a diamond cut pattern to one edge with a 5mm ladies ring with the same pattern repeated to both sides of the ring. 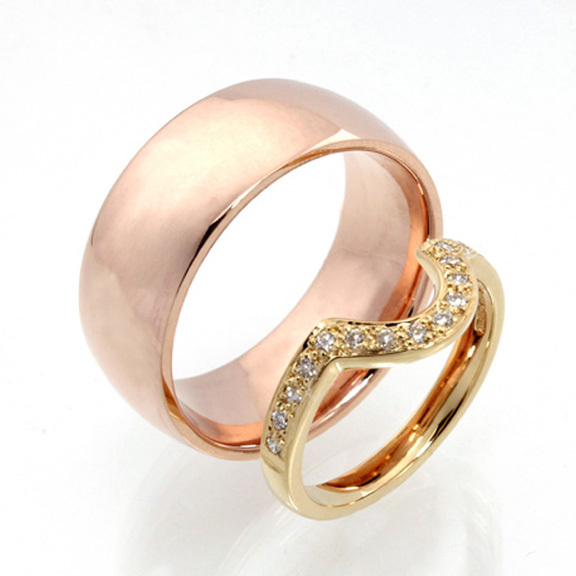 A plain, polished 8mm rose gold band for him and a pavé set yellow gold shaped band, fitted exactly to her engagement ring, for her.